Listen to this week’s PokerActionLine.net podcast to hear BigDave Lemmon discuss this event and much much more. After a 90-minute head-up battle, Chad Holloway has taken down his first gold bracelet. Holloway, whose previous biggest cash was $3,719 in a $1,500 No-Limit Hold’em event at the WSOP in 2012, won $84,915 after outlasting a starting field of 898 players. 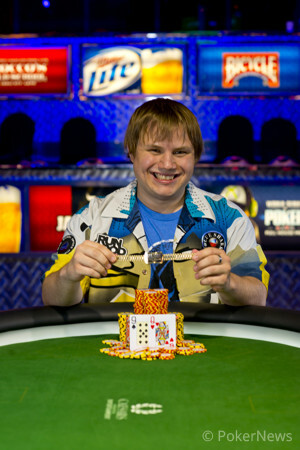 Holloway, a writer forPokerNews, hails from Reedsburg, Wisc. Fifty-five runners advanced to Day 2, at which point Holloway ranked third in chips. Holloway continued to rank among the top stacks for most of Day 2, and he was mostly able to stay out of situations in which he was all in and at risk. The final table contestants were barely seated when the first player was eliminated. Hieu Le jammed after it was folded to his small blind, eventual second-place finisher Allan Kwong made the call with . Le held and failed to improve. Shortly thereafter, everyone folded to Michael Trivett on the button, who raised to 27,000. Holloway three-bet to 77,000 in the small blind, and the big blind got out of the way. Trivett went into the tank before pushing all in for about 200,000 more. After some thought, Holloway called. The flop came , and Holloway supporters cheered from the rail. A on the turn left Trivett drawing dead, and he got up after the dealer rolled out the river. Tyrone Smith was the seventh-place finisher. The action folded around to him in the small blind. Bobby Rooney called from the big blind with against Smith’s . The board ran out and Smith was eliminated. Sean Small, who finished third at the WSOP Circuit Main Event in Council Bluffs, Iowa, for over $54,000 this April, was next to go. He shoved his last 89,000 in from the button and was called by Holloway in the small blind. His failed to improve against Holloway’s . Daniel Ellery went out in fifth when he called off his stack with against the of Brian Pingel on a board of . Pingel flushed him out with an on the river. Pingel’s good fortune wouldn’t last long, as he called a raise from Rooney and they took a flop heads up. The flop brought the , and Pingel checked. Rooney continuation-bet 55,000, and Pingel shipped all in. Rooney snap-called, and the players showed. Rooney’s bottom two pair was in the lead, but he had a lot of cards to fade. A harmless fell on the turn, and Pingel needed a heart or a seven to complete his hand. It wasn’t to be, as a river ended his tournament run in fourth. Three-handed play lasted over an hour, and the chiplead changed hands multiple times. Finally, Kwong raised all in from the small blind and Rooney instantly called off from the big blind. A flop helped nobody, as did an turn. On the river, heartbreak arrived for Rooney in the form of the , and he finished third for $33,903. Kwong and Holloway battled heads up for more than hour. Both players seemed content to play small pots, and a halfhearted observer could have easily followed the back and forth with only an ear to the proceedings. Every time Holloway would scoop a pot, his deep rail section would clap, cheer and activate their screaming eagle sound effects. When Kwong took down pots, the only sound was the clinking of the chips as the dealer pushed them to the man from Oakland, Calif. The heads-up war was slow and close, as neither player could push far past a three-to-two chip lead. Finally, the deciding hand took place. Kwong raised to 75,000 and Holloway called. The flop came . Holloway checked and Kwong bet 85,000. Holloway reraised and Kwong shoved all in. Holloway snap-called and showed for trips. Kwong tabled . The turn and river did not improve Kwong’s hand, and he was eliminated in 2nd place and quietly exited the feature table area after shaking Holloway’s hand. Holloway’s supporters mobbed him as he grinned with joy.